An annual publication of the Professional and Organizational Development (POD) Network in Higher Education, volume 23 of To Improve the Academy is a collection of articles that explore the emerging climate of change is providing a backdrop for the concerns and constituents of higher education. In particular, the authors focus on promoting excellence in teaching and learning through faculty renewal. 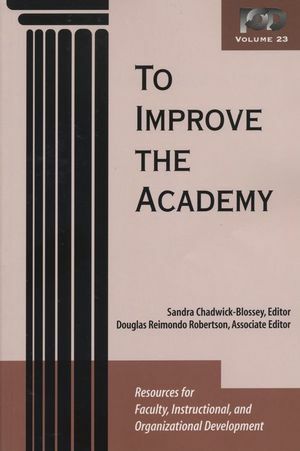 This book offers an essential resource for improvement in higher education to faculty and instructional development staff, department chairs, deans, student services staff, chief academic officers, and educational consultants. SANDRA CHADWICK-BLOSSEY is director of the Christian A. Johnson Institute for Effective Teaching at Rollins College. She teaches undergraduate and graduate courses in organization development and learning organizations. Prior to her eight years at Rollins, she was director of the learning Assistance Program at Wake Forest University. DOUGLAS REIMONDO ROBERTSON is professor and director of the Teaching and Learning Center at Eastern Kentucky University (EKU). He has helped to start three university faculty development center (Portland State University, University of Nevada-Las Vegas [UNLV], and Eastern Kentucky University), and has served as founding director at two (UNLV and EKU). His most recent book is Making Time, Making Change: Avoiding Overload in College Teaching (New Forums Press, 2003). Section I: faculty development in a Climate of Change. 1. Transforming the Environment for Learning: A Crisis of Quality (Lion F. Gardiner). 2. The Institutional Change Agency: The Expanding Role of Academic Support Centers (Robert M. Diamond). 3. Leading Change: Creating a Culture of Assessment (Patricia M. Dwyer). 4. Evidence of the Transformational Dimensions of the Schlorship of Teaching and Learning: Faculty Development Through the Eyes SoTL Scholars (Connie M. Schroeder). 5. The Roles of Teaching and Learning Centers (Alan C. Frantz, Steven A. Beebe, Virginia S. Horvath, JoAnn Canales, and David E. Swee). Section II. Quality of Work Life for Faculty and faculty developers. 6. The Quality of Life of Faculty Development Professionals (Kathleen T. Brinko, Sally S. Atkins, and Marian E. Miller). 7. The Hue and Cry of campus Climate: Faculty Strategies for Creating Equitable Work Environments (Christine M. Cress and Jennifer L. Hart). 8. Exploring the Inner landscape of teaching: A Program for faculty Renewal (Libby Falk Jones). 9. Is the Thrill Gone? An investigation of faculty Vitality Within the Context of the Community College (Cathie J. Peterson). Section III: Best Practices for Faculty development. 10. Using Data to Enhance Colege teaching: Course and Departmental Assessment Results as a faculty Development Tool (Catherine M. Wehlburg). 11. A Vision Beyond Measurement: Creating an Integrated data System for Teaching Centers (Katheryn M. Plank, Alan Kalish, Stephanie V. Rohdieck, and Kathleen A. Harper). 12. Achieving a Campus Consensus on Learning-Centered teaching: Process and Outcomes (Phyllis Blumberg and Justin Everett). 13. Teaching Partners: Improving Teaching and Learning by Cultivating a Community of Practice (Richard A. Holgren). 14. A Faculty development Program to Promote Engaged Classroom Dialogue: The Oral Communication institute (Kim M. Mooney, Traci Fordham, and Valerie D. Lehr). 15. Whispers and Sighs: The Unwritten Challenges of Service-Learning (Rona J. Karasik). 16. Junior faculty Participation in Curricular Change (Judi Hetrick). 17. Assessing the Academic and Professional Development Needs of Graduate Students (Laurie Bellows and Ellen Weissinger). 18. Faculty Development in Community Colleges: A Model for Part-Time Faculty (Patricia Hanrahan Valley). 19. Entertaining Strangers: Providing for the Development Needs of Part-Time Faculty (Patricia Hanrahan Valley). 20. Promoting a Sound Process for Teaching Awards Programs: Appropriate Work for Faculty Development Centers (Nancy Van Note Chism).